Here is the easiest recipe ever for banana bread. I love it because you dirty few dishes, it can be frozen, and it happens all in one bowl. Cream the butter & sugar; then beat in eggs, salt & vanilla. Add soda & flour and finally bananas and nuts. Pour into a floured or sprayed loaf pan. Bake at 300F for an hour or so. Love the look of this - delicious and easy, what could be better. That's exactly it Ms. Kate. 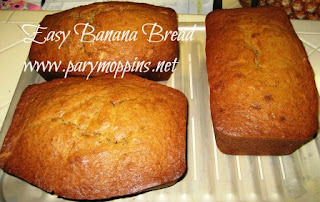 Plus, when the grocery store sells over ripe bananas cheaply,it makes for a very economical breakfast or tea time snack.